New Berlin, Wis.-based Batzner Pest Control recently presented the Food Pantry of Waukesha County with 1,886 lbs. of food. 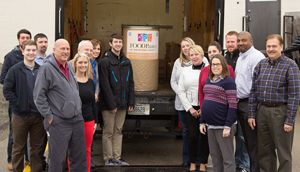 Batzner team members throughout Illinois and Wisconsin were challenged to donate food items at their team meetings in December. Each team’s collection bin was weighed at the end of the competition to see which team would be crowned victorious. With more than 130 team members contributing to the Food Pantry of Waukesha County’s mission, Batzner donated nearly one ton of food. One team even exercised creativity by encouraging employees to bid on homemade specialty nuts. The money collected for the homemade nuts was used to purchase additional food to help the team collection efforts. “We are excited that our donation was able to assist the Food Pantry of Waukesha County in their fight against hunger in the community,” Batzner says.